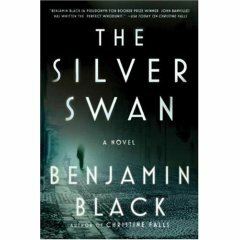 I enjoyed Benjamin Black’s The Silver Swan (my copy sent to me by the publisher), although I also thought it was a bit strange, most particularly so in its ending, which I won’t describe here. I’ll just say the ending struck me as unconventional. I find it hard to talk about conventions in crime novels, as I’m not that familiar with the genre, but the ending — while perfectly satisfying — seemed unusual. I do rather wish I had read Christine Falls first, the book that opens the series; while The Silver Swan stands on its own, it does spend a lot of time reviewing and referring to what happened in the first novel, and I felt I would have been able to follow along better with that context a little clearer in my mind. I’ve read series books out of order before and felt a little less disoriented in those instances. Still, it’s a fine read no matter what. The main character is Quirke (a delightful name, isn’t it? ), an appealing protagonist, a man who (along with many other crime novel heroes I’m finding) has been thwarted in love, struggles with drinking, and is driven by a sense of curiosity that rarely does him any good. His wife Delia died quite some time ago, but the woman he truly loved, Delia’s sister, is recently lost, and Quirke is haunted by the failure of both these relationships. He also has a daughter, Phoebe, who only recently learned Quirke is her father, and she hasn’t yet forgiven him for keeping the secret. Quirke’s life and the lives of those around him are filled anger, resentment, and regret, and Quirke himself is surrounded by an air of melancholy. He’s a former alcoholic, haunted just as much by his longing for a drink as he is by his sense of his mistakes. The mystery itself concerns an old school friend of Quirke’s who unexpectedly appears and asks Quirke, who works as a pathologist, to ensure that his recently dead wife, Dierdre Hunt, otherwise known as Laura Swan, does not receive an autopsy. Naturally, this sparks Quirke’s curiosity, and it comes as no surprise when we learn that Dierdre died under mysterious circumstances. The novel’s point of view switches back and forth among the characters, moving from Quirke’s story back in time to tell Deirdre’s story and later moving into the point of view of other characters as well. We learn that Deirdre, in her Laura Swan guise, ran a beauty salon with the mysterious and slightly sinister Leslie White and that both of them visited the equally mysterious and slightly sinister Dr. Kreutz, who is a “spiritual healer,” an occupation that provokes suspicion in a number of the characters, and rightly so, as it turns out. As Quirke investigates Deirdre’s life and her connections to Leslie White and Dr. Kreutz, he notices that his own daughter Phoebe has connections among these people as well, and then the plot begins to get interesting. I enjoyed the book for its plot, but even more so for the relationships the novel describes; as happens in some of the other crime novels I’ve read, the crime seems almost like an excuse to throw some characters together in difficult circumstances to see how they behave themselves. I would like to go back and read Christine Falls now to see how Quirke began his life as a crime novel hero, and I would also like to read future installments, whenever they might appear, especially in light of The Silver Swan’s strange ending. Now you really have me curious about the book. I’m waiting patiently for the library to get their copies. Isn’t Quirke a great character, sort of idiosyncratic but likable nonetheless. Black’s first mystery was sort of dark, too, and he explores characters and their relationships to each other almost more than the actual crime and its motivation (though that element is still there, too)–he’s like PD James in that way, but still very different. It seems I saw on Amazon that he has another mystery coming out later this year! Ok, this is now going on my list. You have made it sound interesting and I am fairly sure I have looked at it in a bookstore and put it down again. Thank you! Quirke is an excellent name. I mooched Christine Falls a month or so ago so I’ll be sure to read that first. You make me want to hurry up and get to it so I can read Silver Swan! I’ve stalled half way through “The Silver Swan.” I loved “Christine Falls” and “The Silver Swan” really suffers by comparison. It just seems so much thinner, both in atmosphere and characterization. However, now that you’ve dangled the unusual ending in front of me, I feel motivated to pick it back up again! Hopefully the ending will redeem it for me. How intriguing! I’ve heard a lot about Benjamin Black on the blogworld and have been toying with the idea of reading one without ever committing myself. I shall have to read ‘Christine Falls’ just to assuage my curiosity! This sounds excellent but I’m a stickler when it comes to series books so I will have to look for the first copy! Danielle — yeah, he’s like James in the way he’s interested in the characters almost more than the plot. Now I’m wondering if that isn’t true for many mystery writers, or at least the better ones. I’m glad to hear he’s got another one coming out! Stefanie — I hope you enjoy them both! Lucky you to have mooched a copy of the first one! Kate — now that’s interesting. It makes me want to pick up Christine Falls, if it’s that much better than the sequel! I’d be curious to know if you thought the ending was strange or not — it struck me that way, but I’m aware I’m not the most experienced reader of the genre. Litlove — I’ll have to Christine Falls for exactly the same reason!